This post may contain affiliate links for which I earn a small commission. 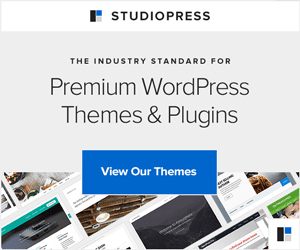 This post contains affiliate links for which I may earn a small commision. 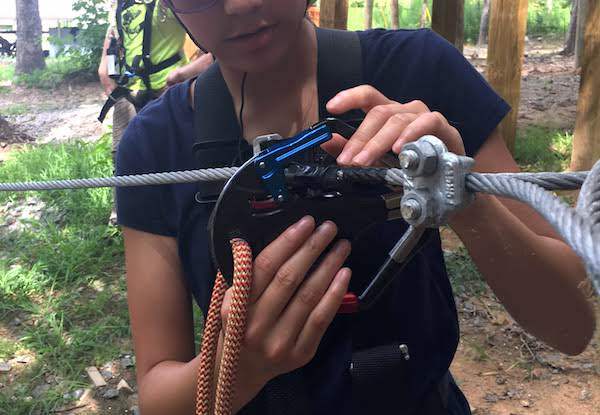 Every time I try a new adventure course, whether it’s a zip line or a ropes course, it seems that each one gets more challenging. 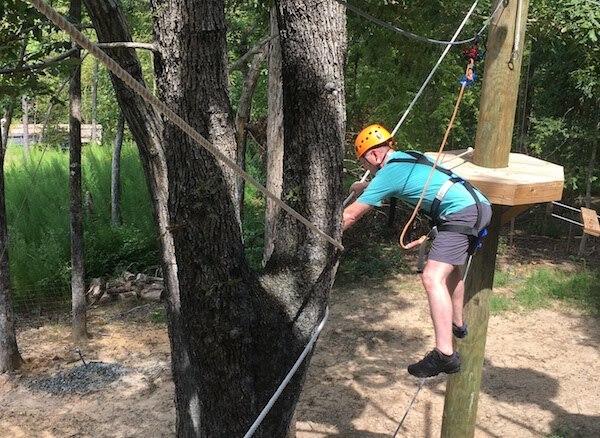 That’s certainly the case with the ropes course at Xtreme Park Adventures, an adventure park near Durham, North Carolina. 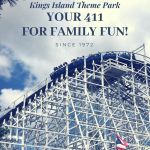 Xtreme Park Adventures has been around for several years, expanding over time to offer more and more activities. Today, the park offers paintball, air soft, a zip line course, laser tag, an escape room and the ropes course for adventurers. Family activities include a kid zone with activities suitable for kids and a gem mine the whole family can do together. We were invited to try the high ropes course, something I’ve done before and was looking forward to doing again. The day arrived, typically hot and incredibly humid. So North Carolina. At the check in area, we signed the waivers (required for all activities at the park). We met our guide, Christian, who took us to an air conditioned room to get fitted with climbing harnesses and helmets. He made sure we understood how the harness worked and then we headed up to the brand new ropes course. 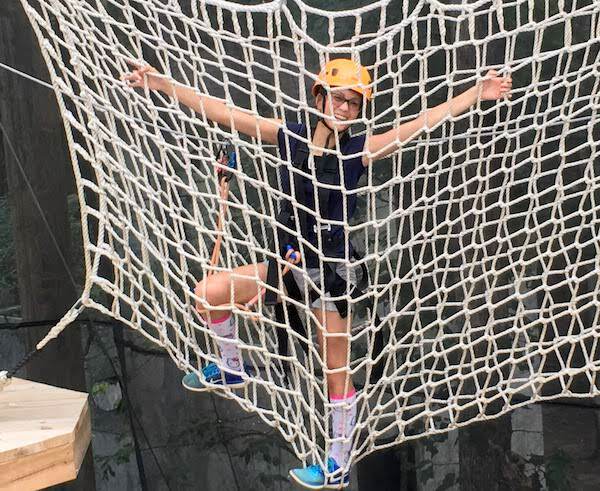 The Xtreme Ropes Course is three stories tall, the challenges built around a central platform. I won’t lie. It looks a bit intimidating. Before we climbed to the first level of the tower, we practiced using our ultra deluxe safety carabiners at a practice rope strung between two trees at ground level. The carabiners lock in so that participants are always attached to a safety line. They’re easy to figure out, and the staff helps when needed. Practice run done, we climbed to the first level. Rob went first, attacking the obstacle with excitement. I love my hubby, so it pains me a bit to say this, but he made it look really hard and really scary! He was a wobbly mess. For the first time in years, I got anxious about an adventure. Christian asked who was next. I pushed Ellie forward, hoping I could regain my confidence. She scampered across like it was nothing! I stepped up to the edge of the platform. And froze. A few years ago, I wouldn’t have considered trying! So, I don’t consider it a failure. I just didn’t have it in me that day. I do hope to try again and will update this post if I am successful! So, Rob and Ellie kept going. Rob made it through the whole first level of the course — some obstacles more challenging than others. He did one loop, a total of three obstacles, on the second level and was done. Ellie, on the other hand, may be part monkey! Or Energizer Bunny! She kept going and going and going. Seriously, she made it look easy, even completing one obstacle with no hands! In just over an hour, she got through all three levels. AMAZING! And she loved it. Rob did, too, though he wants to try again when it’s not so hot. I need to go back and give it a real try! This course is unlike most ropes courses, considered an extreme course. Christian said most people do not get through as easily as Ellie, but that there are some who complete the course in less than 90 minutes. For the rest of us, expect the course to take 2-3 hours. Start on the first level, about 8 feet above the ground and complete two more levels as you climb higher into the forest canopy. Because of the unique, two-sided safety carabiners, you can go through the course independently, at your own pace. Staff is always on hand to offer tips to conquer an obstacle and ensure your safety. 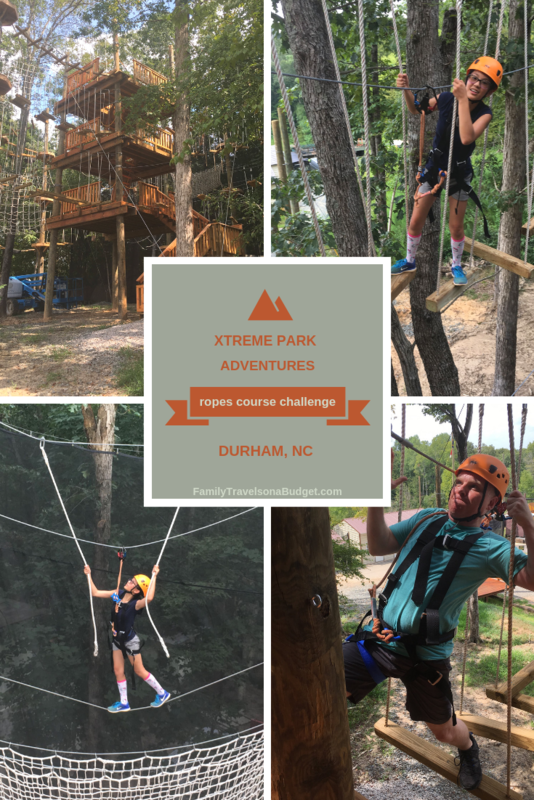 Location: Xtreme Park Adventures is located at 7460 Highway 98/Wake Forest Road, Durham, NC, 27703. Reservations: You can reserve online or call the park at 919 596 6100 to reserve by phone. If you have a group, call. They offer discounts for groups! Cost: As of 2018, the ropes course is $28 for one hour or $35 for a one day unlimited pass. Other activities are priced separately. Budget tip: Check Groupon for savings coupons. Athletic clothes work best, preferably not cotton. It’s also a good idea to wear climbing gloves, though not required. Also, close toed shoes — tennis shoes or hiking shoes — are required. You cannot wear sandals, open toed, slip on shoes and flip flops are not allowed on this course. The minimum height to participate is 48 inches. All climbers must weigh less than 265 pounds. There is no minimum age to participate as long as climbers are tall enough, but Christian said that for the most part, kids should be 8-10 years old to do it. In general, he thinks kids do better on the course than most adults. All participants (or parents/guardians) must complete a waiver before participating. You can do it at the park, but it might be easier to do online in advance to speed up the check in process. If you take a group, I strongly recommend the online waiver form! 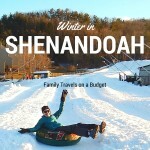 While I chickened out — this time — I still highly recommend this experience. The staff is friendly (and non-judgmental!). It’s a great activity for teens, family bonding and team building. 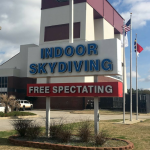 We’d like to thank Xtreme Park Adventures for hosting our experience for purposes of this review. All opinions are ours.